Salesfundaa ERP for Sales and Service is an online application to manage your entire process of Sales and Service functions from any location. Since it is based on cloud, you don't have to invest in any hardware. It is easily adaptable to any business in the Sales & Service industry. It has GST compliance to facilitate ease of invoicing. It can be integrated with Tally to rid you of double entries. It saves time by automating tasks and minimizing non-productive works and thereby saves you time and money. Being on the cloud ensures you get 100% security for your data. It has mobility to facililtate access from anywhere. It is compatible with the Android mobiles. Its user friendly interface allows easy operations by not so tech savvy users. Its scalable and can be made more productive by adding different modules as the business grows and requires further automated processes. Competitive pricing to ensure affordability. 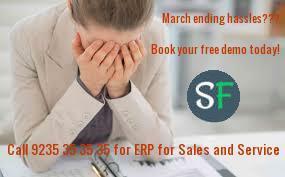 Call Salesfundaa 9235 35 35 35 for your free demo today.